I’ve just completed another art journal from beginning to end — and in one week! When I found a $1 vintage photography book at a library sale (“How to Make Good Pictures” published by the Eastman Kodak company in 1914), I instantly KNEW I had to make it into an art journal! My mind began clicking with ideas that I wanted to try — and I couldn’t wait to start! Unlike other journals I’ve done in the past, this one had a theme (vintage photography) and a colour scheme (black, white, grey, silver, gold, and various shades of brown). Like always, it contains a variety of products, techniques, and surprises. It even has some peek-through pages and pop-up features to keep things interesting! 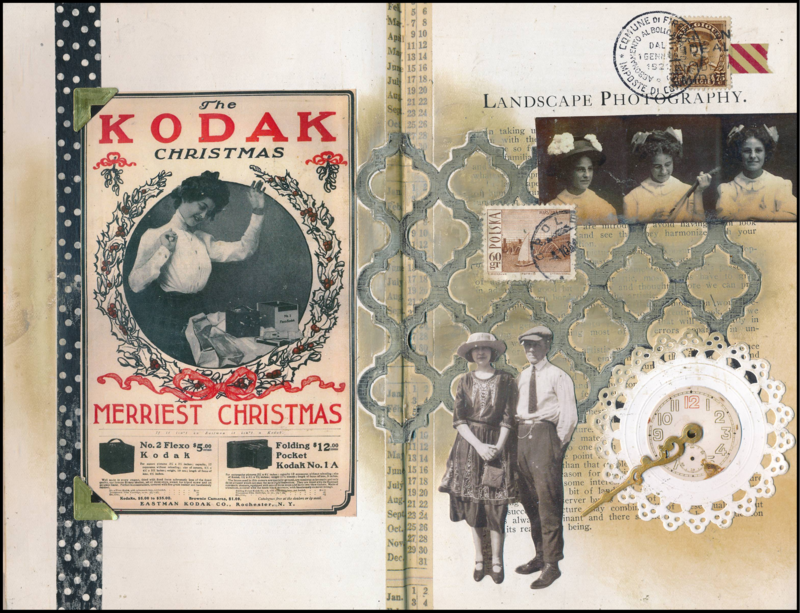 Here is one of the pages: Kodak for Christmas. I began this page with a strip of black-and-white polka dotted washi tape down the left side of the page, followed by a found image of a vintage camera ad. On the right, I pieced together two Tim Holtz lattice dies, and rubbed it with a gold Faber Castell Gelato to soften the black. I layered on more found images (including the Tim Holtz die cut of the man and woman). I rubbed some Distress Ink onto the page using a blending tool, and added vintage postage stamps (one of them, cancelled with a rubber stamp and black Archival ink), a doily, a clock face image, and a metal clock arm. Gold photo corners on top of the Christmas ad completed the page. Lovely Janni, as always ! Love it, Janni. I look forward to seeing more. Love it. Thank you for the ideas!